Analysis shows the chemical index of alteration fluctuated over time in a way that suggested the lake varied between hot, wet periods and colder, drier periods. The shallow water would have been rich in oxidants brought in from the atmosphere and groundwater, and the deeper water would have been oxidant poor. Phosphates, carbon, nitrogen, iron and sulfur, indicating chemistry suitable for life, have also been found there in a variety of compounds. Lead author Joel Hurowitz of Stony Brook University explained, "These were very different, co-existing environments in the same lake[...] This type of oxidant stratification is a common feature of lakes on Earth, and now we've found it on Mars. The diversity of environments in this Martian lake would have provided multiple opportunities for different types of microbes to survive." The scientists also evaluated the fineness of the sediment, meaning the sizes of individual particles of dirt, dust and sand. 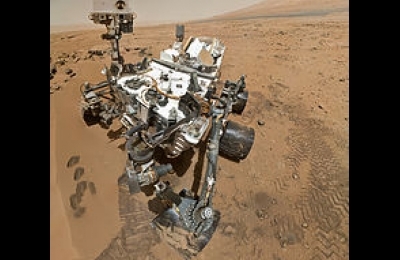 Curiosity found larger grains near the edges of the lake where sediments from incoming rivers and streams would have fed it, and smaller ones in what would have been the deep lakebed, which is consistent with particles dropping out of the water as the current slows down. "We could tell something was going on," Hurowitz said in a statement. "What was causing iron minerals to be one flavor in one part of the lake and another flavor in another part of the lake? We had an 'Aha!' moment when we realized that the mineral information and the bedding-thickness information mapped perfectly onto each other in a way you would expect from a stratified lake with a chemical boundary between shallow water and deeper water."